Some time ago, I tried Dr. Pepper for the first time. I’d been living abroad for a while, and I’d seen it around, so I thought I’d give it a whirl. For someone who spends an extended amount of time out of their home country, perfectly ordinary everyday experiences like that can become shiny and new. As far as this one went, I didn’t know what to expect, but on reflection, I found nothing too special about it either. It tasted like fizzy cherry juice. Big deal. Move along. The same pretty much applies to “Dash and Lilly’s Book of Dares”. Interesting premise. Cute cover. Fun, quirky opening passages. 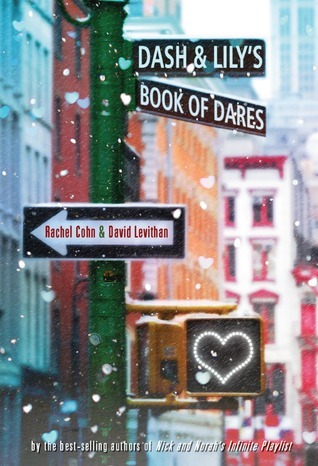 I also quite enjoyed David Leviathan’s “Boy Meets Boy”, so I could reasonably expect to like his collaboration with Rachel Cohn. And yet, the ending to this little romp left me rather underwhelmed. “Dash and Lilly’s Book of Dares” is a very cute story. If you read “Let It Snow” by Maureen Johnson, John Green and Lauren Myracle, then you know what to expect from this book. It’s festive, sweet and inoffensive. The two main leads are cute and quirky in a very non-irritating way, and for a couple that spends most of the book never seeing each other, they have some very good interactions. But there is something this story lacks, and it is unfortunately something that was very strongly missed: Tension. For all the things that happen in this book, for all the dares and drama, there is surprisingly little to hold a reader’s heart. Oh, sure, you want to know if those two crazy kids will end up together, especially after some of the wackier shenanigans they get into, but ultimately, there is no reason to believe they won’t get together. Why shouldn’t they? Their brands of quirkiness are just so specific, they wouldn’t work with anyone else other than themselves. On a serious note, though, it was the feeling of security about this book that left me rather untouched by the story. The kind of things that happen in it strike me as the type that only happen to people in movies or television shows, not something that would necessarily occur in real life. The set-up and effort necessary to achieve some of those dares require quite a bit of trust and effort, and it doesn’t seem like a person would go through with it purely out of boredom. Finally, I guess I couldn’t bring myself to care because the story was just predictable. Is that a bad thing? Not necessarily. I suppose I just wasn’t in the right frame of mind for it. Note: A copy of this book was provided by the publisher via Netgalley, for the purposes of this review. Note the Second: Images and synopsis via Goodreads.